There is no mistake. Toba Lake is the best vacation destination in North Sumatra. Apart from the lake and its small islands, there are numerous villages nearby. Tuktuk Siadong is one of them. This small village is located in a small cape in Samosir Island. Tourists are able to enjoy the beauty of Toba Lake from here. The village offers mesmerizing panorama and refreshing ambiance. The best part is the location. Tuktuk Siadong is situated between Ambarita and Tomok Village. That means you can explore them one at a time. The sky is blue and the weather is nice. Tuktuk Siadong village is definitely a tourist heaven. It has become a favorite destination among tourists. In fact, foreigners have acknowledged its beauty. They even consider it as the best spot to witness the beauty of Toba Lake. There is a great resort and it applies Bataknese architecture. There are different types of trees around it. Visitors can sit and relax beside the lake or ride a speedboat for a lake adventure. Tuktuk Siadong Village becomes a top destination for families. Though, visitors have a distinct reason to come here. For example, they want to spend a wonderful vacation with friends or families. However, some of them come to the village for a honeymoon. It doesn’t matter. This location is meant for everyone. It also features a wild forest and a cultural settlement. Due to its luxury and numerous attractions, the government has chosen it as the central tourism district in Samosir Island. The village is situated in a cape area. That means you are able to enjoy numerous water sports like diving, swimming, fishing, canoeing, etc. When it comes to facilities, you can find good restaurants and hotels. On top of that, there are some carving workshops. Meeting with artists is definitely a worthy experience. If necessary, you can learn how to carve from them. Don’t forget to buy some mementos. That means you should carry more money both for accommodations and souvenirs. Overall, you can do many things in Tuk Tuk. It can be as simple as bicycling around the village. Usually, it takes only 2 hours. The best time is either in the morning or afternoon. It is better to avoid the heat of the sun at noon. Next, the village offers numerous types of foods. These include Bataknese and western culinary. Some tourists also look for local artists. They want to make a beautiful wood carving. It can be either wooden bracelets or necklace. It is easy to reach Tuk Tuk Siadong. From Medan, it is about 240 km. Without traffic, you can reach the village less than 6 hours. What you need to do is to follow Sidikalang-Medan Street to Dolay Rayat. From Barusjahe Street, you need to reach Tuk Tuk Street in Samosir Regency. The village is situated near to the lake. There are some good accommodations nearby. 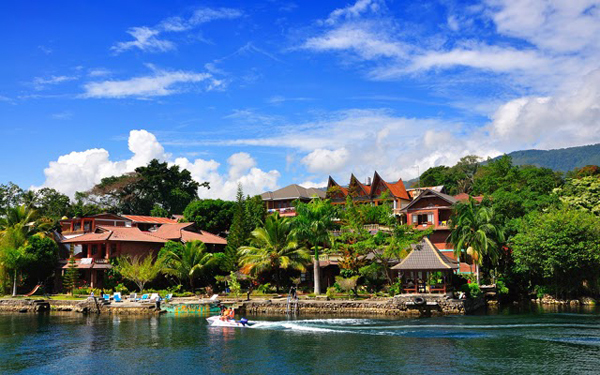 These include Silitong Hotel, Carolina, Samosir Cottages, Tabo Cottages, and much more. Not to mention there are some restaurants and other facilities.